Pushing the envelope of technology is something that happens daily at MIT, so it should come as no surprise when some very unique drone based projects emerge. The Flying Phantograph, a new project from the MIT Media Lab’s Fluid Interfaces Group, is a great example. 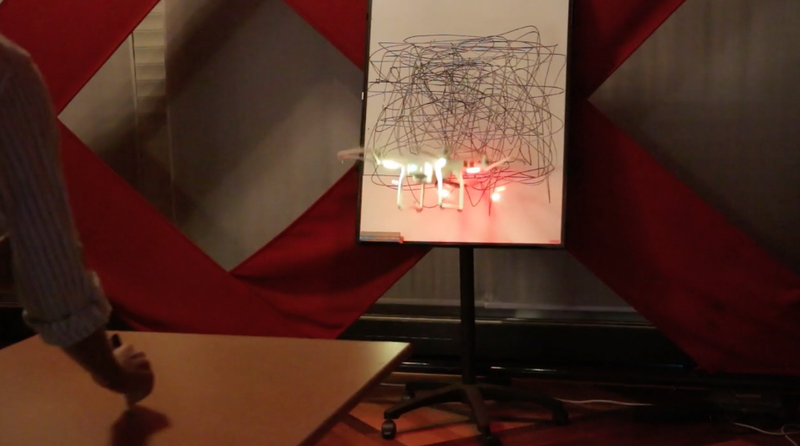 The Flying Phantograph let’s humans and drones collaboratively draw. MIT might not technically be an art school, but for machines it could be the best kunstakademie in the world. The Flying Phantograph, a new project from the MIT Media Lab’s Fluid Interfaces Group, explores the creative potential of drones as collaborators with human artists, effectively teaching these machines to art. Created by Sang-won Leigh, Harshit Agrawal, and Pattie Maes, the Flying Phantograph processes input from human artists, who make drawing movements with a controller. The drone then adds its own aesthetic to final drawing, creating a collaborative piece. a burn-out happened to our machine during an exhibition at TEI 2016. The actual drone being used is a DJI Phantom, which has quickly become the gold standard in consumer drones. At Drone Universities, we recognize the quality of DJI products. That is why all of our Introduction to Drones students receive a free DJI Phantom. MIT, with five schools and one college which contain a total of 32 departments, is often cited as among the world’s top universities. The Institute is traditionally known for its research and education in the physical sciences and engineering, and more recently in biology, economics, linguistics, and management as well. The “Engineers” sponsor 31 sports, most teams of which compete in the NCAA Division III’s New England Women’s and Men’s Athletic Conference; the Division I rowing programs compete as part of the EARC and EAWRC.